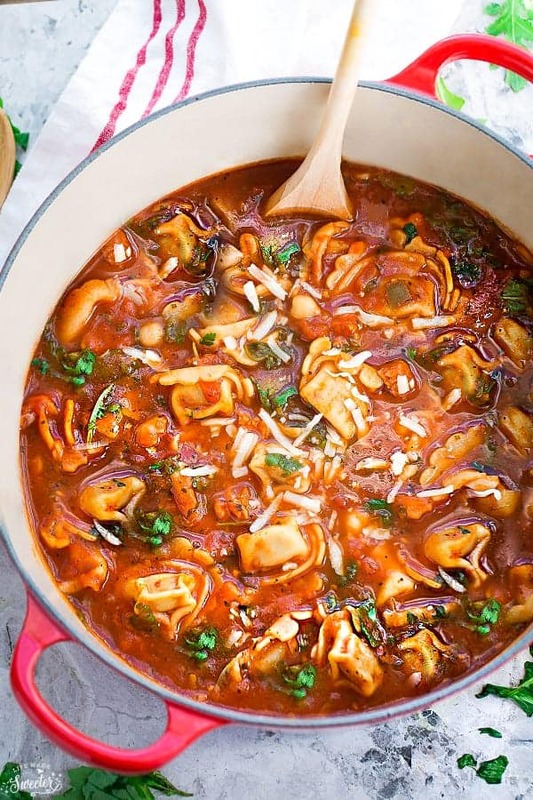 Italian Sausage Tomato Tortellini Soup is the perfect hearty and comforting meal on a cold day. Best of all, this recipe is so easy which is great for those busy weeknights. Gathering at the dinner table with my family is my absolute favorite part of the day. Even though it can get a little chaotic and messy with two littles, I just love seeing us all sit down and enjoy (or at least try to) a meal together. It’s a tradition that we had when I was growing up with my parents and I hope my kids will be able to pass on to their little ones. With winter not too far away, soups like this Minestrone or Tuscan Vegetable Soup become a weekly staple in our house. My kids are big soup and stew fanatics so I love finding new recipes for them to gobble down. 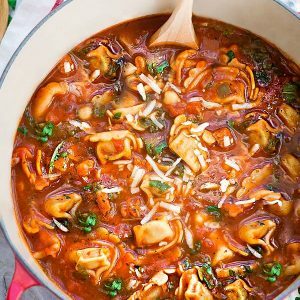 This recipe for Italian Sausage Tomato Tortellini Soup is a classic favorite that shows up at our house regularly. To make this a complete meal, there’s cheese tortellini, Italian sausage and arugula. And for Meatless Mondays, you can totally leave the sausage out and in some white beans instead. 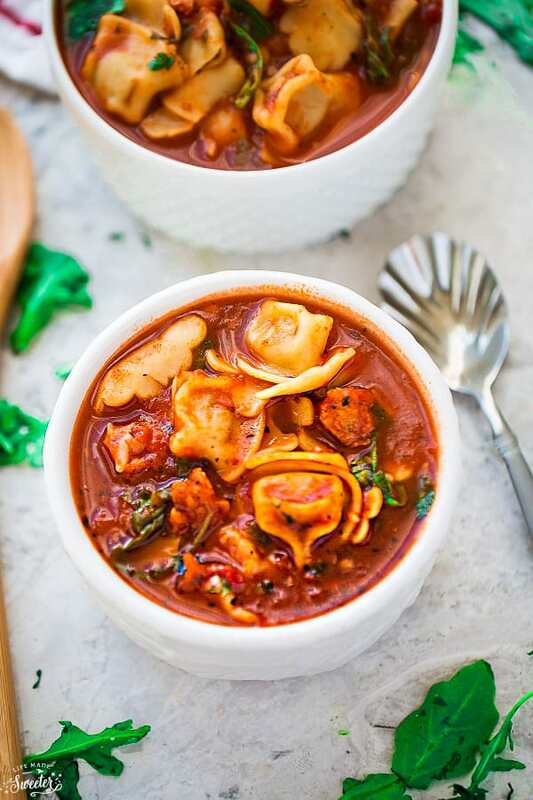 With the long and cold winters we get around here, this Italian Sausage Tomato Tortellini Soup is an easy, hearty and comforting meal that’s just perfect for busy weeknights. 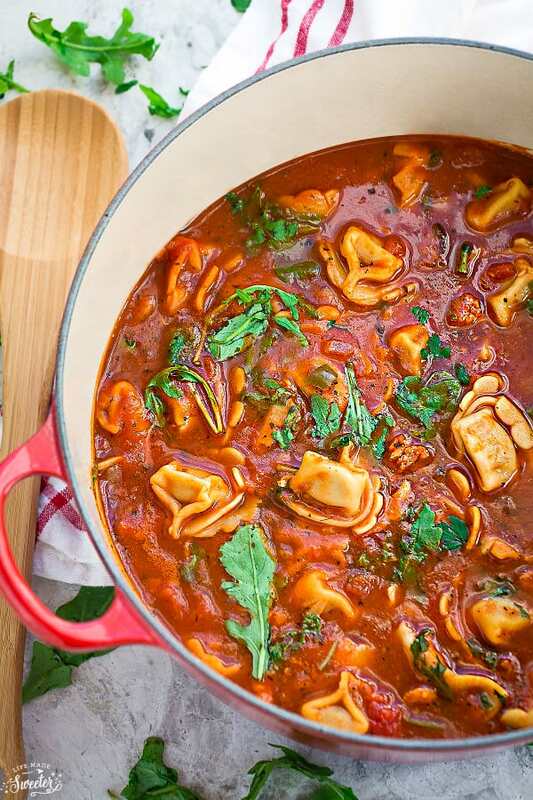 Heart Italian sausage combined with tortellini and a tomato broth, this delicious soup recipe is perfect for a weeknight meal. Pair with warm bread for a wholesome, comforting meal. In a large dutch oven or soup pot over medium heat, brown sausage while crumbling into smaller pieces. Transfer to a paper-toweled lined plate. Drain pot reserving some drippings. Saute onions and cook until translucent, about 3 minutes. Add the garlic and saute for 2 more minutes. Turn heat to medium-high and stir in the diced tomatoes, tomato sauce, and broth. Bring to a boil. Reduce heat then simmer, uncovered, for 10 minutes. Stir in the sausage and tortellini. 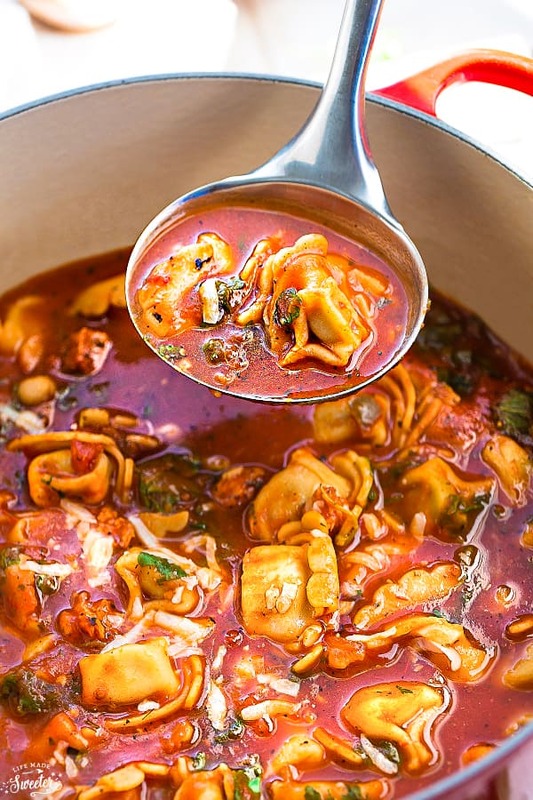 Cover and simmer for 10 minutes longer, or until tortellini is tender, stirring occasionally. Stir in arugula and cook for an additional minute. Taste for seasoning and adjust accordingly. Sprinkle with shredded parmesan cheese if desired. Ladle into bowls and serve immediately.